Lone Star Muscle Cars is proud to present this Low Production 302 BOSS mustang. Powered by the all famous 302 Motor Ford engineers combined the Windsor block with the Cleveland heads, and ended up with the Boss 302 engine One significant feature of the 302 was that the heads were ‘oversized’ relative to the block, and much larger than the competition’s heads. The result was a engine that had impressive power. The stats were impressive for the era: 302 cubic inch ‘Windsor’ small-block V8, with 4-inch bore and 3-inch stroke Modified ‘Cleveland’ cylinder heads, with 2.23 inch intake valves and 1.71 inch exhaust valves Unique mechanical cam with ‘high-lift’ design Crankshaft made out of forged steel and balanced both statically and dynamically Holley 780 cubic feet per minute carburetor breathing through an aluminum intake. The official stats for the production 302 were 290 bhp at 5,800 rpm and 290 lb-ft at 4,300 rpm. Insurance companies were quick to target high-power engines, so it wasn’t uncommon for manufacturers to underrate the engines in their sports cars. The Boss 302 engines installed in the track versions of the Mustang were accurately listed at 470 horsepower. Suspension — Heavy-duty front coils and rear leaf springs were installed to make the 302 competition-ready. To prevent the dreaded wheel-hop that can hamper a car’s ability to get off the line quickly, staggered heavy duty rear ‘Gabriel’ shocks were used. To stiffen the handling, a 0.85 inch sway bar was used in front. Power assist was also added to the front disc / rear drum setup. Transmission a close-ratio 4-speed 3.91:1 Traction Lock, Wheels — The wheels are Magnum 500 chromes, and featured a silver center cap. All New rubber F60x15 bias-ply, chosen with the track in mind. Raised white letters gave the look that we have come to associate with racing tires. Exhaust The manifolds were designed specifically for the 302 in the Boss Mustang. Cast-iron manifolds that fed into a transverse muffler system helped give the Boss its unique and revered exhaust note. Just a little over 7000 were built in 1970 here is a prime example of a true Muscle car. 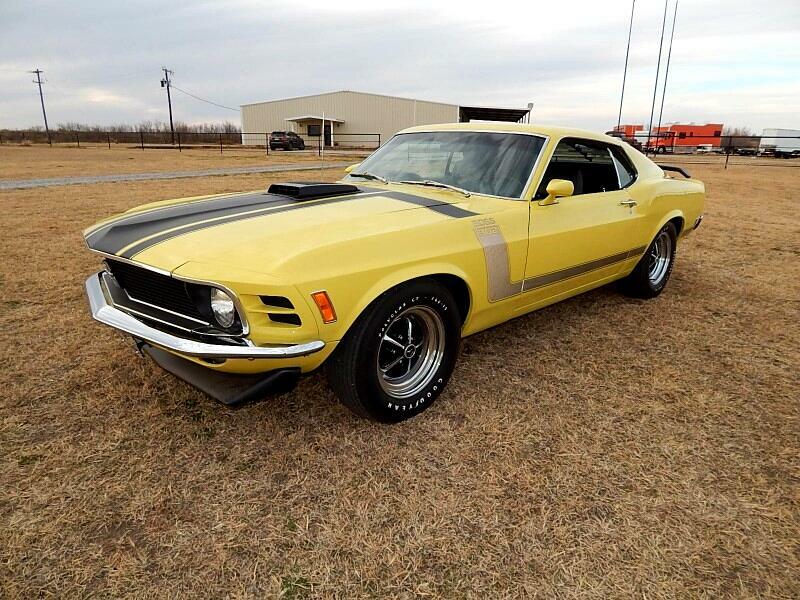 On the Exterior you will see show quality Yellow and Black Paint With The All Famous Boss Stripe Kit And Shaker Hood. On the inside you will notice a very nice and correct interior with the four in the floor. Marti report Available Call for more info.